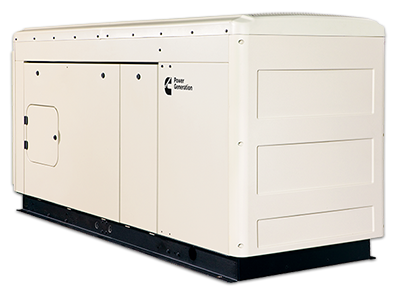 An Onan diesel and natural gas generator set to produce the power needed to run your essential home systems. An automatic transfer switch that immediately senses when utility power has been interrupted, transferring responsibility to the generator. Below is a basic description of how these components operate to provide you with the comfort and convenience your family depends on. Please note that this is an overview only. For specific questions about operation and maintenance, please refer to the operator’s manual or contact an Onan dealer or distributor. Under normal circumstances when utility power is available, utility power runs through the transfer switch contactors, and connects the power to the distribution panel and then to all the electrical loads in a home. The existing electrical system is not compromised in any way by integrating an automatic standby power system in a home. A battery charger is installed and is powered by the utility to keep the starting battery in the generator set charged. When utility power voltage falls to less than 85% of nominal, or fails entirely, the standby power system will automatically go through a start sequence and connect to a home. The transfer switch constantly monitors the power quality from both the utility source and the generator set. When the transfer switch senses unacceptable utility power, the switch waits for 3 seconds and then sends a signal to start the generator set engine. If the utility power returns before 3 seconds has passed, the generator set engine will not be signaled to start. When the start signal is received, the engine starts and reaches the proper operating speed and AC power is available at the generator set. The transfer switch senses this, waits for 3 seconds and will then transfer generator set power to the home through the transfer panel contactors. This sequence of operations will usually occur in less than 10 seconds from the time the power outage occurred to the time when generator set power is connected. When utility power comes back on and returns to your home, the transfer switch senses this and will watch for acceptable voltage. After checking for acceptable utility voltage for five minutes, the transfer switch will signal the transfer switch contactors to re-transfer the load back to the utility source and disconnect the generator set source. At this point, the generator set is “off-line” and will be operated automatically another five minutes to properly cool down. After the cool down cycle, the generator set will be turned automatically off and reset to standby mode. The generator set should be exercised weekly for system readiness. The time of day can be set for the system to operate and it will automatically start and run for a preset period of time. During this exercise period, the power available from the generator set WILL NOT be connected to the home, and utility power will not be interrupted. The generator set can be operated at any time from the generator set control panel behind the service access door. Simply move the “RUN/OFF/AUTO” switch to “RUN”, and the generator set will start and run. Power available from the generator set WILL NOT be connected to the home, and utility power will not be interrupted. The switch must be returned to the “AUTO” position for fully automatic operation.